Sunday March 1st 1908 I have cold and did a lot of sneezing today. I did some baking in the morning and wrote letters all afternoon and evening. I wrote to May, Emma Bivens Alvin [Harty?] and J J [Huebner?]. Will put in most of the day reading. 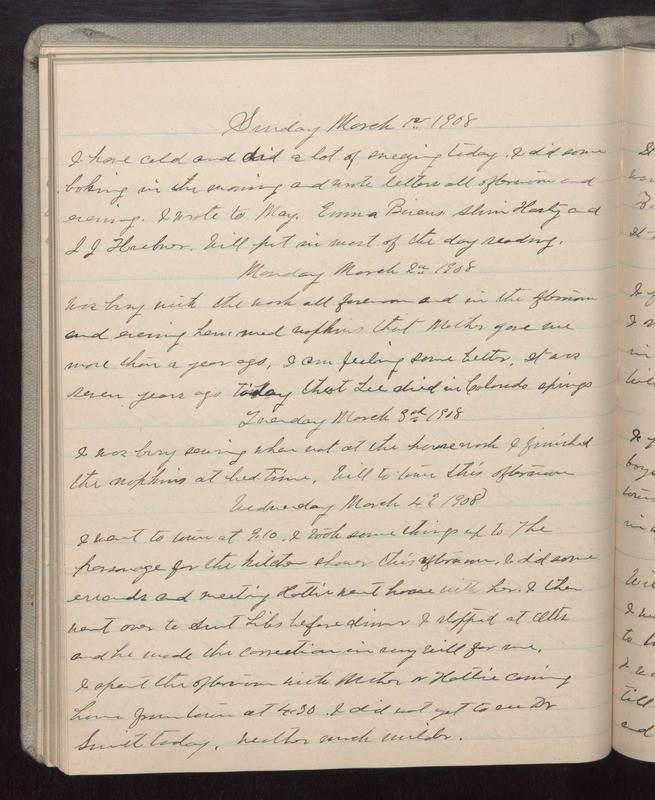 Monday March 2 1908 Was busy with the work all forenoon and in the afternoon and evening hemmed napkins that Mother gave me more than a year ago. I am feeling some better. It was seven years ago today that Lee died in Colorado Springs Tuesday March 3rd 1908 I was busy sewing when not at the housework I finished the napkins at bed-time. Will to town this afternoon Wednesday March 4 1908 I went to town at 9.10. I took some things up to the parsonage for the kitchen shower this afternoon. I did some errands and meeting Hattie went home with her. I then went over to Aunt Libs before dinner I stopped at Otts and he made the correction in my will for me. I spent the afternoon with Mother & Hattie coming home from town at 4.30. I did not get to see Dr Smith today. Weather much milder.